Time flies. 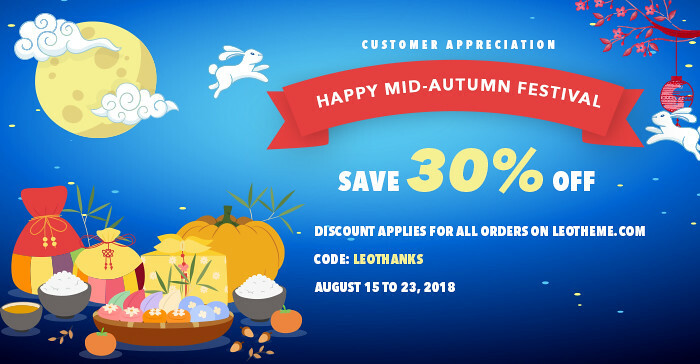 A Mid-Autumn season, which is very important time to reunite for people in Vietnam in particular and in Asian countries in general, is coming close. On this special occasion, we would like to show our sincere thank you for all of your support and loyalty throughout the years. Also, this is a great chance to grab highly responsive themes from our collection 200+ Prestashop themes for only $70. To take advantage of this great offer, simply copy the discount code: LEOTHANKS and enter it when purchasing a subscription, the discount will be applied before payment. Hurry up!!! The valid offer only lasts from August 15th to 23rd, 2018. Don’t miss this special offer to own professional templates. Thank you for always supporting us. Please look forward to new themes and enjoy great support from us!